HomeLitecoinLitecoin’s Price Has Doubled in 2019, What is Driving it so High? 2019 is believed to be the year of cryptocurrencies are most of the community is optimistically waiting for the next bull run to take charge as soon as possible. The crypto market has been pushing up since the beginning of the year and the recent price rally has only strengthened the belief. The recent short bull charge has seen the majority of the altcoins break their key resistance and make double-digit gains, however, there have been two altcoins which have gained the maximum since the start of 2019, TRON and Litecoin. Litecoin’s rise has not been short of a miraculous rise, given it has doubled its value since the start of 2019. On 3rd April it touched its highest price of $98.89, which is its highest price point since November last year. If measured accurately, this is a 230% growth since the beginning of this year. However, the pullback had caused it to lose a bit of its total gain, but even looking at its current value the gains stand at a whopping 200%. If we talk about generated returns, the performance is better than not only Bitcoin but also Bitcoin Cash, Ether, and XRP. 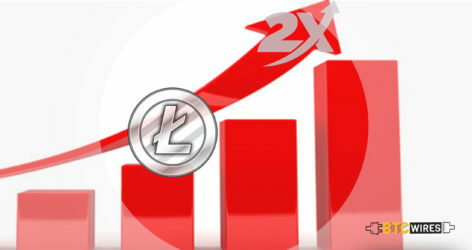 Let us look at some of the factors which have aided the phenomenal rise of Litecoin in 2019. It’s quite a common occurrence in the decentralized space that the prices of particular token go up before the halving of the rewards. Litecon is set to go through block reward halving later this year, and it would reduce the block reward by 50% from its current value. Many analysts predict this is one of the major reasons for the prices to go up. Another factor which might be fueling the prices is predicted to be because of the larger adoption and merchant support in recent times. According to the SFOX report, thousands of merchants are accepting Litecoin payments online now. The Litecoin network’s adaptability and price on the rise because the developers have ensured that the transaction speed is quite fast and still improving it, while the transaction fee is on the decline as well. LTC’s transaction processing speeds have grown consistently due to the addition of nodes while its transaction fees declined.